Go to "Google My Business." Almost every businesses will show up in an ordinary search on Google, but not near the top. But, there ways to make your business rank higher and make it much easier to market your business. If you have a new business, you need to go to www.business.google.com and click "get on Google". Then go through the steps to register your business. A complete profile is important. You will receive a postcard at your business in about a week- do not lose this, you'll need it to verify your business. If you business is not verified then it may not show up in searches. Sometimes, other problems may occur, and I can help you with this. There is no charge for this. Your Google Business Listing will have all your basic business information, and you can add some photos through the dashboard. Use good quality photos. How do I get my business ranked higher on Google? Get customers to review your business on Google. Google Street View|Trusted takes it one step further by showing a photo package including 360 interactive panoramic views of the inside your business, plus professional quality still photos. So how do I get there? If you want to upgrade your listing, you will hire a Google Trusted Photographer to create a virtual interactive tour of your business, and shoot a series of professional quality still photos. Google requires a Google Trusted Photographer who is trained and certified by Google to provide high-quality and consistent photography. 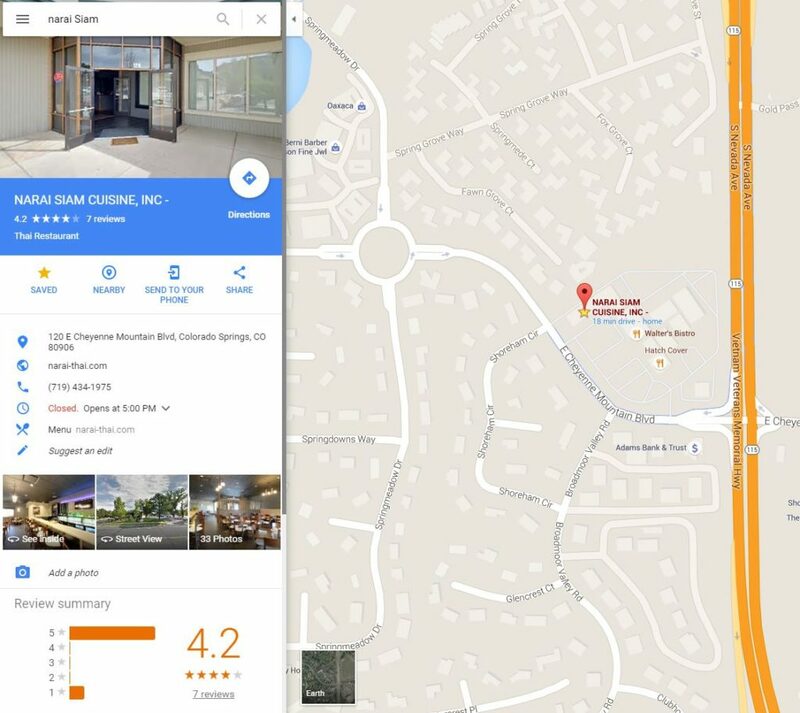 Below you can see a listing for a restaurant that has upgraded from a standard Google Places listing to a Google Business View, with Virtual tour, and professional photos. Using maps you might want to search for a business, such as a restaurant in your area. 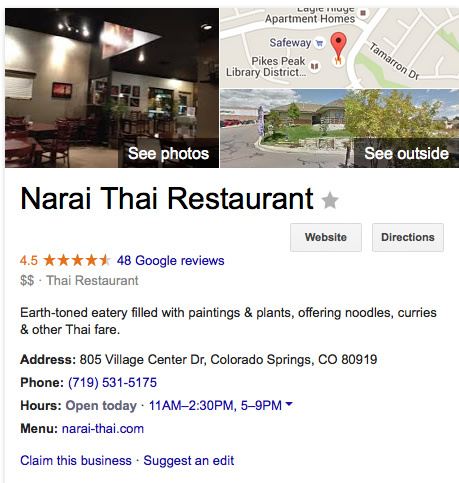 Restaurants that are listed on on Google Business Listing will show up with a red icon on the map. Those places with a virtual tour will see a thumbnail inviting them to "see inside" on the google places listing . Sessions take from 30 minute to a few hours for larger businesses. Make sure the business is clean, remove clutter, I want to make it shine. I like to shoot just before opening, before customers are there. I can shoot with people in the business, and I blur their faces for provacy. The business owner pays for the photo session. Google does not charge for placing the photos to work with their interface. The owner can use the photos and the tour on their website or other marketing material, and they own the photos. Tours are as low as $199 for a minimum package and go up based on the number of panoramic views. Please consult our pricing page for cost information. We will schedule the visit at your convenience. A photo session can take from 1 hour on up depending on the number of panos. We can shoot even when customers are there, because all faces and identifying feature are blurred in the post production process. Restaurants will want to have some prepared dishes to shoot for the feature photos. A once over to spruce up and remove clutter is recommended. Medical and Dental practices must have no people visible in the shots, for privacy. How soon will be the photos be published? Depending on the number of panoramic views, your tour will be up in about 5 days. Post production is required to assemble the panoramic views and edit the photos. How do I get them on my website? We will provide you with the code you need and instructions to get the tours and photos up on your website.